As far as a publicity gimmick, it was inspired – but as far as a practical way to market a listing it strikes me as an expensive, time-consuming practice. But as a recent issue of Wired magazine reported, this push by Fortune 500 companies has been largely ignored by most residents (see How Madison Avenue Is Wasting Millions on a Deserted Second Life) who seem more interested in exploring the seedy side of cyberspace. This approach has several advantages. One, it’s free. Secondly, Google Earth is far more accessible to average consumers. Users do not have to register with the service, a simple download to their desktop suffices. 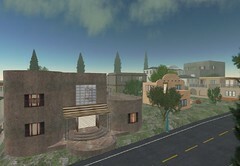 Further, users do not have to create an ‘avatar’ and subject themselves Second Life’s unituitive learning curve, with it’s bizarre teleport and flying behaviors. Google Earth is a complex 3D rendering of the real world, but one that ultimately is easy to navigate – and a listing inside its confines has the necessary context and relevancy missing in Second Life. Marketing a property with Google Earth doesn’t have the headline pull of putting a listing inside Second Life – but at the end of the day, could be far more practical and useful.